Started streaming August 16, 2017. Watch the trains go by. Joetsu Shinkansen, Tohoku Shinkansen, Hokuriku Shinkansen, Saikyo line, Shonan Shinjuku line, Takasaki line, Utsunomiya line. The front is Omiya direction, the back is Ueno direction. An explanation of what you are seeing. I think I saw you squid! Tenticles all over the window waving! 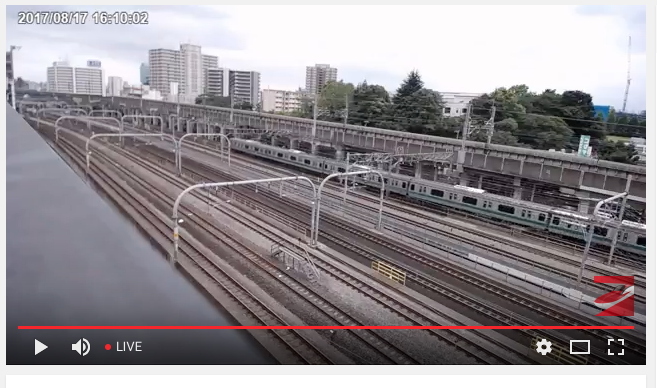 After my first minute there was a pass of 4 trains and a Shinkansen at once. Not the charm of wakamatsu, but lots o trians! Great find, pretty good variety on the shinkansen line too. I noticed a bunch of the e233's have one motor car with a second pantograph not in use, is this a back up of some kind? Heh, I should be able to watch myself going past. Did you manage to snap a picture of the camera as you passed? Sure beats sitting at home at least! I found this myself by accident when I got home from work at lunch time, I'm still watching it at 7.30. As it was the Saikyo line I'd probably be doing it a favour. Live overhead spark. Somethings not grounded.